Black clothes will always find a home in my closet, where they are adored through out all seasons. Question: do most people like to wear dark colours only in the winter, just to reflect the weather? I think it's funny that (potentially) people could be colour coding unconsciously with the colour of the sky. I find myself gravitating towards black ensembles whenever I don't know what to wear and just throwing over either something bright, patterned or anything that can create that contrasting element, even if it was a hideous potato sack with cut out sleeves. I honestly believe that you can totally rock bold pieces as long as you've toned it all down, especially with black. But if you had intentions of looking like a potato sack then go all the way, don't listen to me - I don't even colour code with the weather. These are actually photos taken by my friend for her fashion video and I really like how they turned out. The only problem during the photo shoot was the fact that the wind was constantly slapping my face. Here is grand proof of the hardship I went through tackling the weather. I think black colour is always good. Another great look, I love the colour! thanks for the comment on my blog. great coat! i love the colour!! awesome! love the pop of yellow!! love the short vid clip too! wow that jacket is stunning! and i lovee the way you styled it with the all black, super chic! 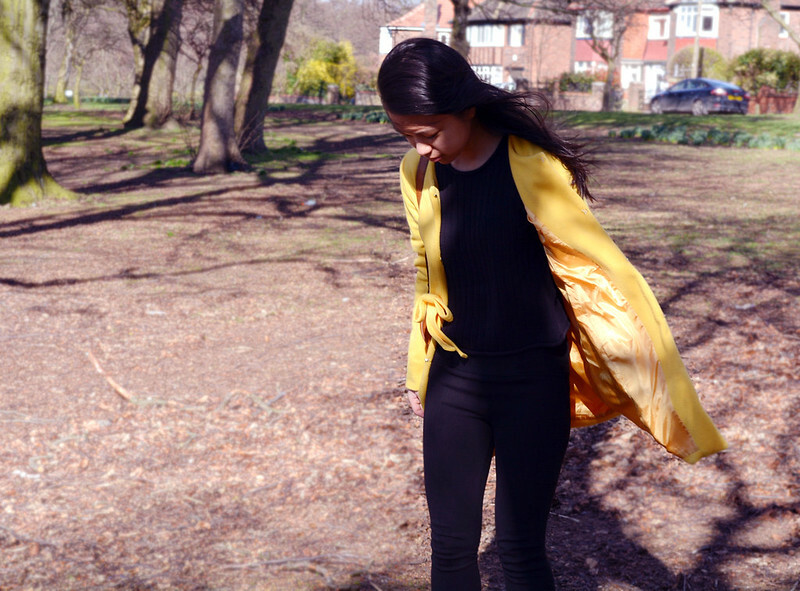 in LOVE with your yellow coat <3 looking RAAAAAD! You both look great, I love the pictures of London too!